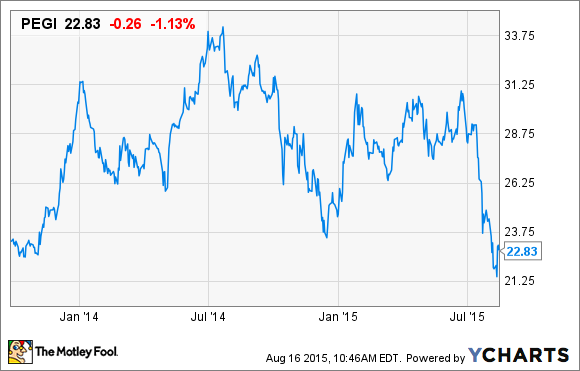 Pattern Energy's Q2 Earnings: Is Now the Time to Buy This Wind-Energy Stock? A good earnings report and crushed shares -- what's an investor to do? Spring Valley Wind Farm in Ely, Nev. Source: Pattern Energy. If Pattern Energy Group (NASDAQ:PEGI) did a good deed by reporting a positive second quarter, than it makes sense that shares did not go unpunished -- currently, they're hovering near the all-time low. Fools know that this is nothing to necessarily fret over, though. Rather, it may present a welcome buying opportunity for those looking to power their portfolios with some wind energy. On the top line, Pattern Energy had a solid second quarter. Despite low winds that negatively affected power generation, the company grew revenue 30% year over year from $64.9 million to $84.7 million. Attributing the revenue growth and earnings increase to the start of operations at several new facilities, Pattern Energy reported adjusted EBITDA of $66.8 million -- a 14% improvement over the same period last year. Year to date, the company has adjusted EBITDA of $113.6 million, an 18% improvement over the same period last year. But there's also cause for caution. The company's earnings growth relies primarily on expanding its portfolio of wind and solar energy projects, which it accomplishes through third-party acquisitions and through acquisitions from its parent company, Pattern Development. In expanding its portfolio last quarter, the company took on more debt while decreasing its cash position. Becoming more leveraged, Pattern Energy now sports a net debt-to-EBITDA multiple of 10 -- not a red flag necessarily, but at least a yellow one. Management also recognizes this situation as concerning and is looking to lower the ratio through the rest of the year. On its second-quarter earnings call, the president and CEO, Michael Garland, stated that "through the end of the year, unless the market improves along with our stock value, we do not anticipate dropping down or acquiring any new assets." Pattern Energy has only been publicly traded since October 2013, and, since then it has been offering a dividend each quarter. From its IPO until now, the company has raised the dividend 16%, recently declaring a third-quarter dividend of $0.363 per share or $1.452 on an annualized basis. With the stock trading a little under $23 per share, this translates to an enticing yield of 6.30%. Yes, that's high, but it's deceiving, as shares have taken a nose-dive recently. More importantly, management is confident that it can afford and sustain the payout. For the second quarter, Pattern Energy reported $28 million in cash available for distribution, or CAFD. This figure amounts to a 75% increase over what the company reported for the same period last year. But, illustrating management's cautiousness, the dividend rose only 13% during the same time period. Looking ahead, management appears to be confident that it can still meet its guidance for annual CAFD. In elaborating on the company's decision to resist expanding its portfolio through the rest of the year, Michael Garland commented that "we believe, such decisions are prudent, and will not jeopardize our meeting our CAFD per-share growth targets." At the end of the first quarter, management estimated that CAFD would fall between $81 million and $87 million. During the last earnings release, management reiterated that guidance. Although the company may refrain from acquisitions for the rest of 2015, it has its sights on nearly doubling its current portfolio capacity to 5,000 MW by 2019. The company currently has 13 identified right of first offer, or ROFO, projects that total 1,270 MW, so, by its calculations, it needs only 1,448 of new ROFO projects or third-party acquisitions to meet its 2019 target of 5,000 MW. In the past, Pattern Energy has managed its risk by developing a geographically diverse portfolio. It has facilities in the U.S., Canada, and Chile, but it's also expanding into new markets. Recently announcing its entrance into the Japanese market, Pattern Energy added five projects, totaling 128 MW, to its ROFO list. This follows Pattern Development's acquisition of a majority stake in Green Power Investment Corporation, an investment firm headquartered in Japan. Earlier in the year, Pattern Energy announced that its parent company had entered into a joint venture with Cemex Energia, a subsidiary of Cemex, to develop wind and solar projects in Mexico. The companies believe that Mexico offers plenty of opportunity to develop wind and solar projects; the country recently announced a mandate to obtain 35% of its power from clean energy sources by 2024. The market has been on a wild ride this year, and Pattern Energy's recent stock movement has demonstrated that it's no exception. The company continues to follow its growth plan and has decided to put further acquisitions on hold for the moment while it replenishes its cash position. Shares have never been much cheaper than they are now, and for those patient investors with a strong stomach for volatility, now seems like a good time to open (or add to) a position. Of course, that's just one Fool's opinion -- investors must do their own due diligence.